Thailand has implemented comprehensive cybercrime legislation, which helps to enhance confidence in information technology (IT). Thailand also has good laws for electronic commerce and electronic signatures. However, Thailand has no privacy laws, and this is a major weakness. In January 2015, two Copyright Amendment laws were approved: the Copyright Act (No. 2) B.E. 2558 (A.D. 2015), and Copyright Act (No. 3) B.E. 2558 (A.D. 2015). These two new laws implement many of the key provisions of the WIPO Copyright Treaty. They also introduced an Internet service provider (ISP) liability scheme for copyright infringements that applies in broad circumstances. Additional risks in Thailand include mandatory Internet censorship (some of which is clearly political in nature) and filtering, and procurement preference policies. 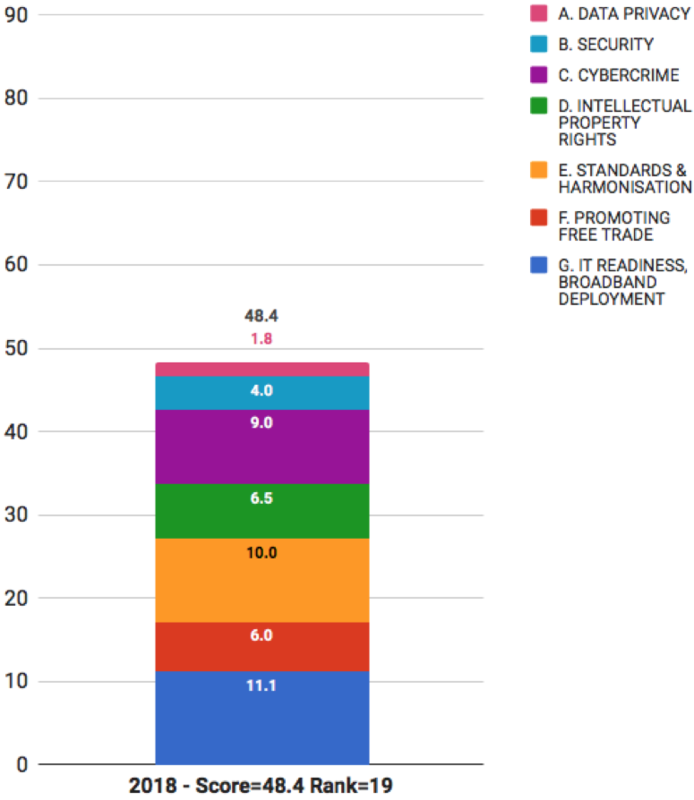 Overall, Thailand’s position in the Scorecard rankings has risen slightly since 2016 — from 21st to 19th — mostly because of incremental improvements in the Cybercrime and Intellectual Property Rights sections. Improvements in the IT readiness and broadband Developments based on the Thailand Digital Economy and Social Development Plan 2016 are also ongoing. - 17th for IT readiness and broadband deployment.